When you go, I would recommend staying at the Courtyard by Marriott on the ocean at Jensen Beach. The suites are spacious and the bathrooms have been upgraded with marble tile and adjustable shower heads. I love the large balconies overlooking the Atlantic Ocean. There are a lot of great restaurants in the area too. I ate at Conchy Joe’s – the food was overpriced but tasty. Still, you have to make a point to hang out there with appetizers and drinks for the spectacular view. ﻿﻿﻿﻿﻿﻿The deals on cruises are out in full force this spring. First, I want to let my readers know about a very time-sensitive offer from Royal Caribbean through Orbitz. Four-night cruises to the Bahamas are priced starting at $199, and many other Royal Caribbean cruises are also discounted. Royal Caribbean is also offering a $1,000 airfare credit on specific cruises, free pre-paid gratuities, and $100 in spending. The catch? You must book by midnight on April 15. Click this link to book: http://cruises.orbitz.com/. Another amazing cruise deal this week is from TravelZoo.com via Travelocity: you can get a seven-night Mediterranean and Greek Island cruise starting at $399. For information, visit: http://www.travelzoo.com/cruises/europe/1013926/?ptl=done&rating=&tppct. If you are not signed up for TravelZoo’s e-newsletter already, you are missing out on great last-minute deals on hotels, cruises, and vacation packages. Where are you cruising to this year? Just like in the Gulf oil spill, some of the most affected people in Japan are the numerous fishermen and fishing companies whose livelihoods have been destroyed by the earthquake and tsunami. I strongly recommend one U.S. organization that makes sure donated funds go directly to these fishing families. The Alaska Fishing Industry Relief Mission (AFIRM), which donated money to fishing families during Hurricane Rita and the BP oil spill, is raising money for the Japanese fishing communities. The all-volunteer organization sends 100 percent of donated funds directly to fishing communities. AFIRM has already donated $20,000 to the cause. “Our hearts and prayers are with the Japanese people as they seek to recover from the terrible tragedy, and we will look for guidance from them on how best to use the resources we raise to assist their fishing communities,” said Larry Cotter, chair of AFIRM. 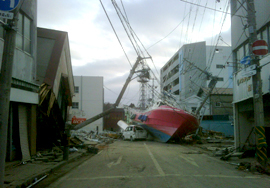 To find out more about AFIRM’s relief efforts, visit www.AKJapanHelp.org or call 907-586-2820.